Learn the ins and outs of boat detailing from world-renowned detailing expert Mike Phillips in a hands-on workshop! The Marine 31 Boat Detailing Class covers all the major aspects of boat care and detailing including proper washing, boat oxidation removal, wet sanding to remove scuff marks and scratches from gel coat, canvas cleaning and protecting, mildew removal from vinyl seats, and much, much more, all of which you will learn by doing! The Marine 31 Boat Detailing Class will give you the experience and knowledge to detail boats like a professional! If you sign-up by January 8th, 2020, you'll receive a FREE $100 store credit to kick off your boat detailing arsenal! Boat detailing – where do I start?! Surely you’ve asked yourself that question, or else you wouldn’t be researching and reading about the best boat detailing classes in the first place. We have an answer for that question, and it’s the Marine 31 Boat Detailing Class. If you plan to detail boats for profit, then this class is a MUST. Mike Phillips provides an in-depth look along with thorough instructions on how to properly machine sand a boat, remove sanding marks and oxidation with a high speed rotary polisher, machine-apply a wax using a dual action polisher, and more! You will have plenty of time to practice these new skills as you will learn them all by actively doing them yourself during the class! For more information on what you'll learn while taking this class, please visit this Autogeek Online Forum thread - you'll be able to check out past pictures, learn what you'll be doing each day, and check out a couple pictures from the previous class! CLICK HERE FOR MORE INFORMATION. Mike Phillips has over 36 years of experience in the field of boat and auto detailing. Mike has over 250 articles to his credit, and operates Marine31Online.com, a discussion forum that’s all about boat care and detailing. In 2013 Mike Phillips and Marine 31 teamed up with John Greviskis and the Ship Shape TV crew to offer in-depth segments on proper boat care and maintenance, including boat oxidation removal, boat vinyl cleaning and protecting, how to clean non-skid on boats, and boat metal polishing and protecting. You may also recognize Mike Phillips from the TV show Competition Ready on Velocity, and other shows like Chasing Classic Cars with Wayne Carini, My Classic Car with Dennis Gage, Two Guys Garage, and Motorhead Garage, where he has made guest appearances demonstrating various tools and techniques for detailing. 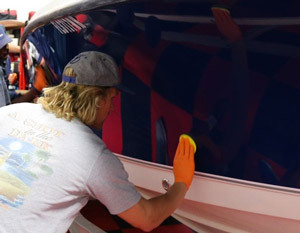 When you attend a Boat Detailing Class at Autogeek with Mike Phillips, you'll have hands-on training for everything from FLEX polishers to applying ceramic coatings to gel coat - and everything in between! "Calling all Fellow Boat Detailer's! I wanted to share my experience & Benefits of taking the Marine 31 Boat Detailing Class, in February of this 2016. I have been detailing for 13 years, and of that, the last 8 years specializing in Boats. Averaging 35-40 Boats a year, but was looking for a way to grow my business & increase production. Taking this class was a real game changer for me, especially in the wet sanding/ buffing and get coat correction part of the class. I was humbled after the class to say the least. All this time prior I had had been buffing out boats the wrong way, (only foam or only wool) no wet sanding. After seeing and experiencing the correct process in the class, I was more then ready to get home use the newly acquired skills from this class. Needless to say it has completely turned around how I detail a boat, I have tripled the amount of boats I was detailing a year (35-40 per year) to this year, I have completed 80 boats since March 1st, 2016, and am well on my way to my goal of 100 Boats this year. The quality of my work has vastly improved and my customers have taken notice. I owe all of this to Mike Phillips, who after meeting him at SEMA, encouraged me to take the Class. WOW and thank you is all I can say! If you haven't taken the class yet, I would highly recommend it. Even if you are not detailing boats full time, TAKE THE CLASS, it is one of the Best Detailing Classes you will ever take."